Small African braids are now not only very fashionable but also extremely practical. For them not to care as something special, the hair wash is often not necessary. In addition cornrows protects the hair from external influences. Of course, to weave such microkey long, but you will get a unique look that distinguishes you from the gray mass and attract to your person interested views. In African braids, you can weave artificial hair, acrylic or cotton yarn. The minimum length of hair, in which you can do cornrows, weaving them into strands from 4 to 5 cm In case you want to do these braids yourself, use your hair. Rascalities carefully before you start to weave. The head on the eve of this is better not to be washed, because clean hair would crumble in your hands. Then nice and neat braids does not work. Divide the hair gently in small equal curls. Each of them secure with a clip or barrette. If the small braid you weave for the first time, many of them do not need. Without experience you are unlikely the first time to plait your braids so that they were all equally nice and neat. In addition, you may just be tired – not used to it. Start braiding each lock back, choosing any convenient way. Can you recommend "the mermaid tail" or "French ear". Braid pigtails from the bottom, separate the strands at the neck; the top should be gathered into a tail. Continue stitching to the end, treating the ends with special glue. You can also weave in braids with decorative beads or ribbons. If you decide to add to your natural hair or synthetic hair, place them under each lock of a bundle of artificial hair, and then braid the braids together with them. When finished the bottom row, you go above. Each following row should be approximately 2 cm above the previous one. Clearly observing the distance between the rows and curls to the hairstyle to be neat. The tips of the braids immediately attach the ribbon, bead, special glue or wax. Don't forget about the location of tresses. To braids looked carefully and beautifully, ensure that the curls were the same size and evenly distributed on the head. 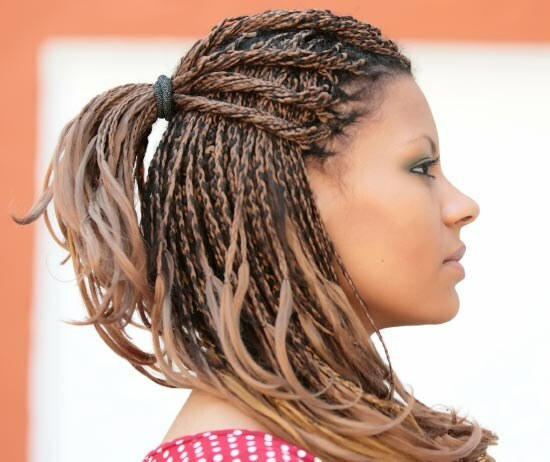 To African braids were smooth and straight, braid his hair blond them as tight as you can. If you want to try on your head African braids and want everything to be done right and you don't have to sweat for hours in the mirror, please contact the salon in advance asked whether there weave small braids. Professionals will take care of everything.